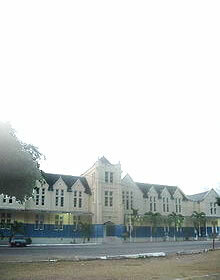 Falmouth, the parish capital of Trelawny, was created towards the end of the eighteenth century, when sugar was “king”. It was created because Martha Brae the previous capital was unable to handle the volume of trade resulting from the prosperity of sugar, and the inability of its small harbour to facilitate the larger ships transporting the produce of the parish. Beginning at the Phoenix Foundry to Tharp House, Falmouth had numerous wharves, which served the town. These included Davis’ Wharf now Central Wharf, Jarrett’s Wharf now Hampden Wharf, Tharp’s Wharf later known as Government Wharf and Barrett’s Wharf later known as Trelawny Wharf. 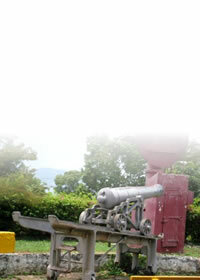 The Foundry was constructed around 1810 by Mr. Field, an engineer. The roof was entirely of slate until sometime between 1905 and 1910 when it was bought by Messrs. Delgado Bros., and attached to the Central Wharf premises. The workers at the Foundry were mainly Scotsmen, who were capable of repairing all machinery of the sugar estates in Trelawny and adjoining parishes, as well as repairing ships docked at the Falmouth Harbour. John Tharp, the owner of Tharp House and Tharp’s Wharf was a wealthy planter who owned a number of estates in the parish of Trelawny. 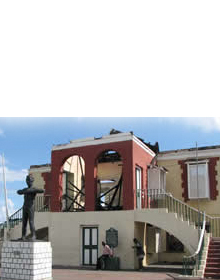 The wharf made him the most self-sufficient planter in the island, because it was rare for a planter to build a wharf. Tharp also went into slave trading and made a handsome profit from the importation of the 400 Ibos from West Africa in 1782. Tharp died on July 30, 1804, just months after bringing another batch of Ibos into the island. By 1850, a pier was constructed between Tharp’s Wharf and Barrett’s Wharf by George Atkinson at a cost of 219 pounds. The pier was built to facilitate embarkation when the wharves were closed. It was recommended that in constructing the pier, “a jetty be run out from high water mark 100 feet long by 12 feet wide with pitch pine piles 12 feet apart properly placed and covered with pitch pine planks.” Later, an additional 100 feet was added. The pier lasted until August 11, 1903, when it was completely destroyed by a hurricane. Steamships began to arrive in Jamaica in the 1830s and by the 1860s were doing most of the island’s carrying trade. This signalled the demise of Falmouth as a major port. Unlike the traditional sailing ships, these bulkier vessels needed deeper waters to dock and the Falmouth harbour was not deep enough to accommodate them. Attempts were made to deepen the harbour, but the additional expenses were a constant deterrent. Added to this, by the 1890s railway lines ran throughout the island and it became more efficient to used ports, such as Montego Bay, which were easily accessed by rail. So the town of Falmouth was eventually bypassed for Montego Bay and the commercial success of Falmouth was by the 1900s a memory. The Falmouth Wharves stand as a reminder of the town’s former glory. The warehouses were tall single floor structures built of brick, cut stone and or timber with slate or zinc roof. The warehouses of Hampden Wharf were built during the First World War 1914 – 1918, from disused building at Maxfield Estate.